Portland couple Samantha and Andrew Maiden decided to celebrate their fourth wedding anniversary with an intimate vow renewal at the charming Gray Gables Estate. For this second time saying “I do,” they wanted the celebration to reflect their quirky personalities and retro style. 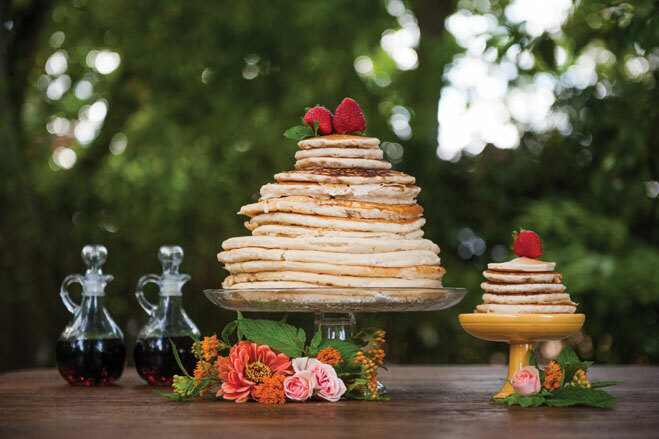 So rather than the traditional wedding cake, they opted for a less conventional goody: a stack of old-fashioned fluffy pancakes. Made by the bride herself, guests were drooling over this pancake tower drizzled with syrup and topped with fresh strawberries. Frying up a stack of flapjacks on the big day isn’t for everyone, though it is the specialty of baker Erin Fale of Newberg’s Sugarhouse Cake. Fale’s pancake cakes come in a variety of flavors and toppings, including banana, blueberry, pumpkin and whipped cream. She can even make them heart shaped. Now there’s a sweet treat.